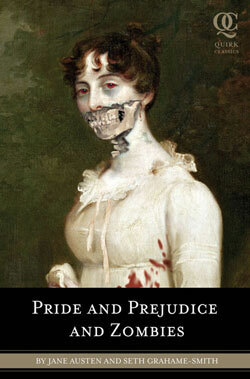 Anyone who disapproves of mashing up Pride And Prejudice with zombies is obviously wrong. The idea alone is so magnificently crass that even if it Seth Grahame-Smith’s contributions fail utterly to be scary or funny, it will still be brilliant. Just look at the cover. Amazing. If you wanted to be agonisingly clever about it, you could even say that there’s a powerful interplay of subtext. Think about it: Austen’s Regency middle class living on the profits and products of empire, together at last with a zombie mythology which tried to codify the relations of exploitation and control defined by slavery! If that doesn’t work for you, the gothic farrago of Northangar Abbey should be a reminder that Austen was never too sniffy about a sharp bit of genre interplay. And if you’re still not happy, I’d still say that a zombie resurrection is still preferable by miles to another insufferably polite teatime costume drama revival.